We offer Heat Detectors. A heat detector is a fire alarm device designed to respond when the convected thermal energy of a fire increases the temperature of a heat sensitive element. The thermal mass and conductivity of the element regulate the rate flow of heat into the element. 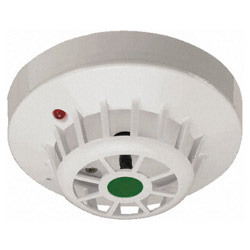 Owing to our expertise, we are wholesaling and supplying an extensive array of Fire Safety Products in Tamil Nadu. Our offered products comprise Fire Suppression System, Fire Sprinkler System, Fire Hydrants System, Fire Alarm and Fire Extinguishers. These products are manufactured using high-grade raw material and sophisticated technology at vendors’ unit. These products are applicable in various industries, offices, hotels, restaurants and residential areas. To cater superior quality products in accordance with international standards, our vendors also test the entire range of defined norms. In addition, these are strictly tested at our in-house testing unit before dispatching to clients. We also offer services like Fire Safety Consultant Services and Fire Safety Audit Services in Tamil Nadu. We provide these products in different specifications that perfectly meet clients’ requirements. These products are known for their durable finish standards, high tensile strength, high efficiency and robust design. Apart from this, these products do not require much effort in maintenance, can withstand adverse conditions and are excellent in performance. Further, these are easy to install and have gained huge demand in the market due to their light weight.